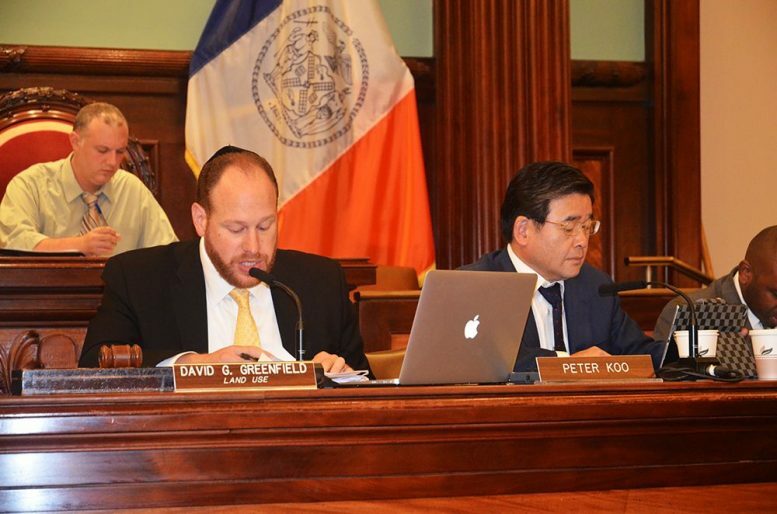 Council members David Greenfield and Peter Koo lead a public hearing on Intro 775 last September. photo by Evan Bindelglass for Curbed NY. Yesterday, the City Council’s Land Use Committee voted through a contentious bill that would impose deadlines on the Landmarks Preservation Commission and its process of designating historic properties. Preservationists and their allies on the City Council overwhelmingly oppose the bill, Intro 775-A, because it would force the LPC to consider buildings and historic districts within two years of being calendared. Despite some vocal objections, the committee approved the bill 12 to 4, with one abstention. The majority of the Land Use Committee supported it, but even some members who okayed the bill said the deadlines – and the landmarking process in general – had shortcomings. The proposal would create a clock that starts when the commission votes to put a property on its calendar, which is the first step on the road to landmark designation. For individual properties, the commission would have a year to hold a public hearing and vote on whether a building should be landmarked. Individual buildings could get a one-year extension past the deadline, if the landlord approves it. Owners often see landmarking as another layer of expensive, bureaucratic process that makes it harder to maintain their properties. For historic districts, the deadline would be two years from the date they’ve been calendared. The commission would get a year to hold a public hearing and then another year to vote on the district. Once these deadlines pass, the properties or districts are taken off the commission’s calendar. And the LPC can’t request an extension on designating historic districts, at least under the current version of the bill. The original version of legislation, Intro 775, was even stricter. It proposed a five-year moratorium on reconsidering items that had passed their deadlines and been dropped from the calendar. In that time, landmarks could be demolished, dramatically altered, or otherwise redeveloped. However, 775-A dropped the moratorium – a move that many council members said they were happy about. The legislation will also give LPC 18 months to deal with items that are already on its calendar. The agency is gradually whittling down a backlog of potential landmarks that stretches back nearly 50 years, to when the commission was first created by Mayor Robert F. Wagner. Council members David Greenfield, Brad Lander, Ritchie Torres, Jumaane Williams, and Mark Treyger enthusiastically voted yes on 775-A. They were joined by Council members Peter Koo (also the bill’s sponsor), Ydanis Rodriguez, Debi Rose, Donovan Richards, Inez Dickens, Andrew Cohen, and Vincent Gentile. Torres called the legislation “a watershed achievement,” and Treyger cracked, “I’m hoping to be alive to see the day that the Coney Island boardwalk gets landmarked,” as he voted yes. He voted against the proposal, along with Council members Rosie Mendez, Inez Barron, and Dan Garodnick. Mendez felt that the bill simply hadn’t been debated enough and needed more public input, even after the six-hour-long public hearing held to debate the original version of the bill last fall. Garodnick said that the LPC should be able to secure a one-time extension on an individual landmark without the permission of the property owner. UPDATE 6/8/2016 3:30 p.m.: The full City Council has passed the bill.